One of Terrain Aeration's current Unsung Heroes, Keri Jarman of Moor Park Golf and Country Club was on hand at Saltex to help celebrate the company's 10th anniversary and open nominations for this year's awards sponsored by Pitchcare and the English Golf Union. Now in their eighth year, the Unsung Hero Awards are open to any Greenkeeper or Groundsman, deemed to be outstanding in his or her dedication to the industry, whether it be help and support given to colleagues, extra effort in the face of adversity or sterling, solid performance over and above the call of duty. In other words, those who go that extra mile without any thought of reward. The winners will be announced during Harrogate Week, having been judged by representatives from BIGGA, the IOG and the STRI, and will receive holiday vouchers, a framed certificate and a cheque for £200. 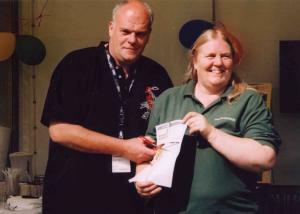 Caption Image 1: Keri Jarman left, cuts the ribbon on this year's nomination forms with Terrain Aeration's Lynda Green. 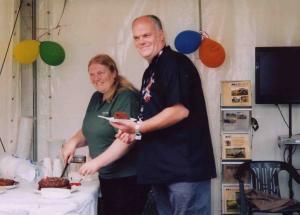 Caption Image 2: Lynda Green cuts Terrain Aeration's 10th birthday cake, helped by Keri Jarman.